Boom Shaka was a big deal back then; the music got all kids on the streets singing along and enjoying, while the group’s fashion sense was just out of this world. Following the announcement of a planned performance by 90s mega-group, Boom Shaka, at The Sands on Sunday, the group’s name trended on Twitter today, leaving many tweeps in disbelief. Today’s kids will never know the struggle of singing the wrong words to a song they enjoy. This is what happened when we tried to sing along, or should I say rap along, to Thembi Seete’s lyrics on Boom Shaka’s early 90s hit, It’s About Time. To this day, no one really knows for sure what she was saying in her raps. She might as well have been cursing us all and no one noticed. You see, Boom Shaka was enormous back then; the music had the streets going crazy, while the group’s fashion sense was just out of this world. 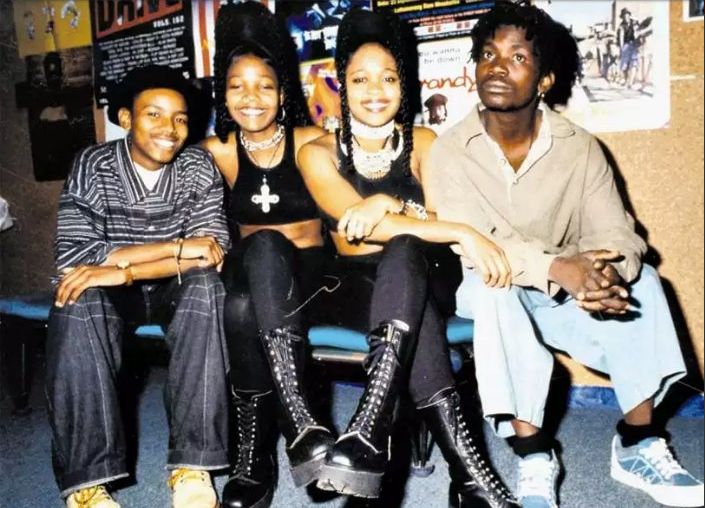 Thembi Seete and the late Lebo Mathosa wore shiny (p)leather boots, tops and pants – which somehow made complete sense in that era. Seete was the rapper and Lebo Mathosa the singer – both were also good dancers who had us thinking we were as flexible as they were – while Theo Nhlengethwa also sang and Junior Sokhela added a coarse-voiced ragga flavour to the mix. The hairstyles were also unique; Thembi and Lebo loved huge box braids, while the guys had dreadlocks. I believe it was also the group, and perhaps Tupac and Jackson, that made nose rings cool back then. In this week’s edition of a throwback Jukebox Thursday, in anticipation of Sunday’s show, we look back and give you five songs that got all of us dancing to Boom Shaka.